Europe Endpoint Security Market is expected to grow at a CAGR of over 7% during the forecast timelinedue to favorable government initiatives and public-private partnerships to improve the cybersecurity infrastructure. The Graphical Research report presents a detailed evaluation of “Europe Endpoint Security Market Analysis based on Component (Software, Service), By Deployment Model, By Application, Regional Outlook, Industry Report, Growth Analysis & Forecast, 2017 – 2024”, predicted to cross USD 1.5 billion by 2024. 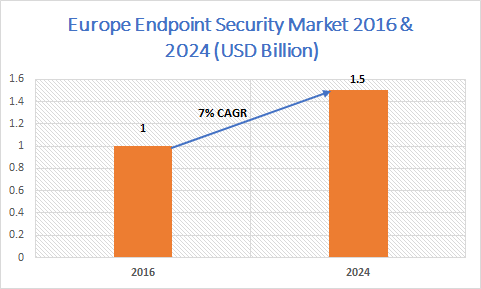 The Europe endpoint security market is expected to witness a sharp growth over the forecast timeline due to the rising internet penetration and the rapidly growing market for ICT and telecommunications equipment & services. As the demand for internet services ranging from online payments to the management of strategic & critical national infrastructure increases, the risks of cyber-attacks will also rise. To address the emerging and existing cyber threat landscape, government agencies in the countries, including Germany, France, the UK, and Spain, are making efforts for the development of a robust security infrastructure. For instance, the German government introduced a new cybersecurity research agency in 2018 with an investment of USD 225 million over the next five years. The agency aims to make Germany technologically-independent of other powers with regards to cybersecurity. The cloud deployment model segment is expected to witness a growth rate of over 9% from 2017 to 2024 due to the heavy usage of cloud computing platforms. The growing cluster of data centers will increase the adoption of cloud computing & other networking technologies. The SMEs in the region are increasingly investing on cybersecurity solutions through cloud deployment models to take advantage of the most advanced available solutions at cost-effective price points. The UK endpoint security market is projected to register an accelerated growth between 2017 and 2024. The UK government sharpened the law enforcement response to cybercrimes. The government is focusing on enhancing education & skills and establishing & strengthening work relationships with other countries, businesses, and organizations globally to build a cyberspace that will support strong societies. To achieve this, the government invested approximately USD 800 million of public funding for four years under the National Cyber Security Programme. Some of the key vendors in the Europe endpoint security market include Kaspersky Lab, Comodo, Webroot Cisco, ESET, F-Secure, McAfee, Microsoft, Symantec, Trend Micro, Sophos, Ahnlab, IBM, VIPRE, and Panda Security.